Decorate any space with a superhero theme with new posters from PosterNation.com. Social media was abuzz the past couple weeks with the announcement that Ben Affleck will star in an upcoming Batman movie. 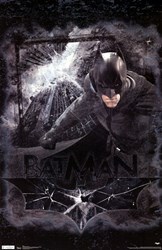 The announcement created a steep rise in sales of Batman posters, on PosterNation.com. This prompted the website to add a larger selection of superhero art prints to its inventory. The new Batman posters available feature Hollywood stars such as Michael Keaton, Val Kilmer, George Clooney and Christian Bale. Shoppers will also find posters of vintage Batman comic book scenes, Robin, Catwoman, the Joker and more. Framing services are offered for all art prints on PosterNation.com. More than 1 million framing options are available to customize each purchase. Enjoy a 25 percent discount on all posters and framed art prints through September 30, 2013. PosterNation.com offers thousands of high-quality framed art prints and posters featuring themes that include sports, movies, music, pets, animals, travel, motivational topics, hot people, vintage celebrities and more. The frame shop allows customers to customize their purchase by selecting the cropping, matting, framing and glazing for a framed art print or poster. Please visit http://www.PosterNation.com for more information.